Connect PC and tracks, DSmain / DCC/MM2 shields etc. Prepare DSmain or DCC/MM2 shield (assembled with Arduino). This page shows the instruction of CameraS88. You can try CameraS88 easily! You need Webcam, PC and DSmain or DCC/MM2 Shield, also model railway. 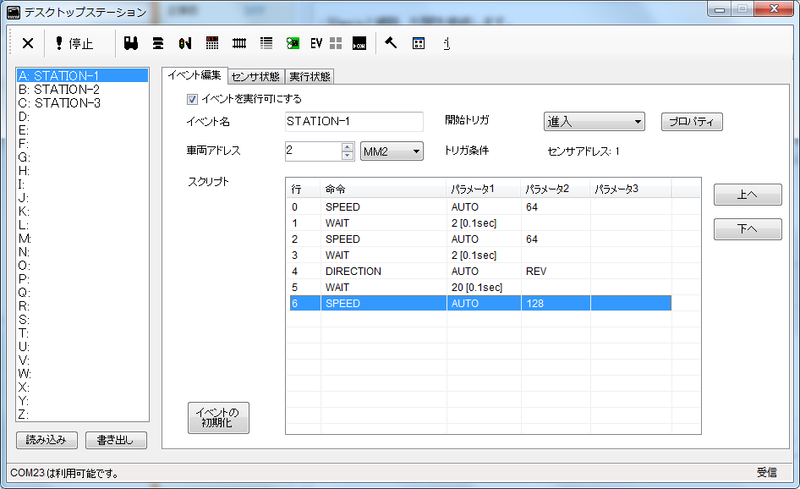 You can download Desktop Station and CameraS88 software. Ofcourse, these software is free of charge. Prepare and assemble your track for playing model railway. Please assemble your rails. Then you don't need to place the locomotives. Connect tracks and trackbox, PC. After that, place web cam. 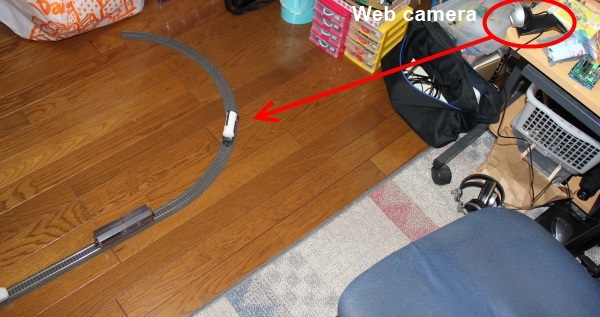 Because you are caught in web cam cable. You need to check the visible point of your layout. Of course, you can select the monitor area which you want to sense the locomotive. You have to prepare booster or trackbox. Fore example, DSmain, DCC/MM2 Shield with Arduino, Railuino kits etc. Run CameraS88. You can see the window. Click start button of CameraS88. Check the view of web cam. If the position is wrong, you need to adjust the position of web cam. After that, please keep the web cam. Click register button. Do not place the locomotives on the track. Then Do not place your locomotives. If did, CameraS88 doesn't work correctly. Register S88 areas. Drag the image on the window, you can add new sensor areas. When double click the area, you can adjust the position and size. Registering requires a virtual S88 address. Please assign S88 address. Please watch the following instruction video. Please check the registered area. When the background color is like the locomotives, the recognition may not failure. Yellow box means recognized area. Red box means selected area. Keeo CameraS88 software and run Desktop Station. Please click start button and provide power on the track. Desktop Station can communicate with CameraS88 automatically. When CameraS88 doesn't run, Desktop Station priors S88 decoder signals. Please check the recognition of the locomotives. Then, you need to check the S88 sensor status in the event script window on the Desktop station. When the locomotive is on the Address 3 area on the CameraS88, the address 3 shows green on the Desktop Station. When the locomotive is on the Address 1 area on the CameraS88, the address 1 shows green on the Desktop Station. You can edit an event script which controls your locomotives and turnouts triggered by S88 sensor. Please see the following instruction video. You can adjust the reaction level of CameraS88's recognition. Use 2 parameters of Threshold box. Matching value: This value means the threshold of color difference between registered image and present image. Default value is 32. This value means the threshold of color difference is 12.5%. This value can set 0 to 255. When the value is more bigger than default value, the recognition area will be decreased. Block value: This value means the recognized border line of the blocks. The block is showed box on the window. You can set it 0 to 255. 128 means that the 50% of the box is reacted.